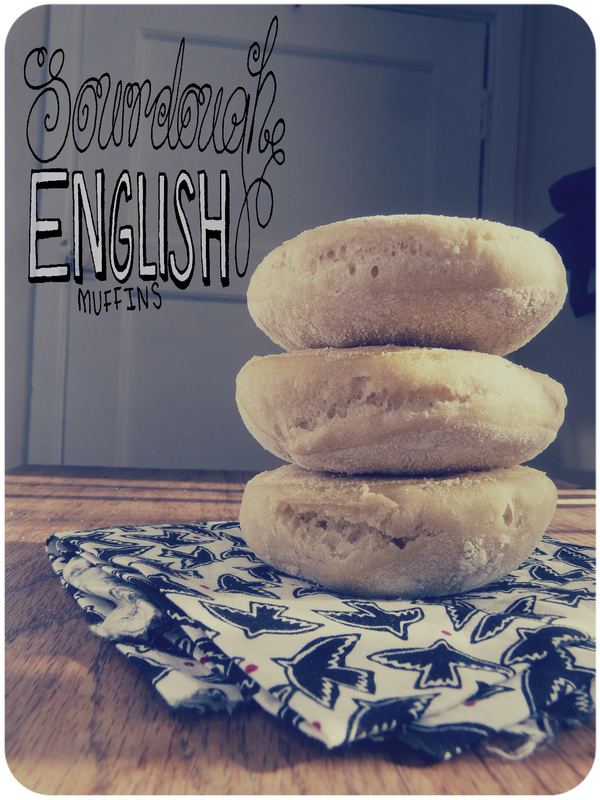 Homemade english muffins are tasty little discs of comfort, perfect for brekkie. In my house we also use them as buns for mini homemade veggie burgers with some vegan mayo, lettuce and whatever else we fancy. You can make them using bakers yeast but as with anything else, using your sourdough starter makes them even better! Crispy on the outside and pillowey on the inside, tear them open and toast them for instant bliss! Mix together all the sponge ingredients in a large mixing bowl and cover, leave overnight just on the counter. In the morning punch down the sponge and mix the remaining dough ingredients and knead for 8-10 minutes on a floured surface until you have a nice elastic dough. Shape into a bowl and allow to rise for 1 1/2 to 2 hours, turn the dough out onto a floured surface and gently roll out until the dough is 1/2″ thick,, using a 3″ cookie cutter that has been dusted lightly with flour cut out about 18 disks and transfer to a baking sheet that has been lined with baking parchment and dusted with semolina. Dust the tops with semolina and allow to rise for another hour. preheat the oven to 200c/400f and bake for about 15 minutes, flipping about 5 minutes before the end of baking. Cool completely before slicing in half and toasting, then serve slathered in olive oil spread! This entry was posted in Breads, sourdough, VeganMoFo 2013 and tagged baked, baking, bread, breakfast, dairy free, food, recipe, recipes, vegan, vegan baking, vegan mofo, vegan month of food, vegeterian. Bookmark the permalink. These look so perfect! must try! Definitely! You need something “yolky”! 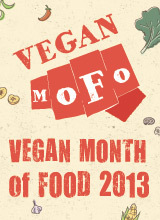 Have you tried, The Vegg? It’s way too much like egg yolk. I used it in bread just today, it works well added to bread glazes and I wused a little bit in scrambled tofu, but it does have a strong flavour- creepy but nice but creepy in my opinion…. You’re torturing me with all these beautiful bread recipes! I HAVE to get a sourdough starter going once MoFo is finished and I’m settled in my new place. since I’ve got to keen a wheat allergy in mind when cooking/baking, I am now trying to substitute wheat AND spelt flour – rice flour comes to mind. wondering if rice flour works here? I can almost taste those muffins now…I haven’t eaten bread for ages now. I gave it up for lent and then forgot to take it back up when it was over ;). Must admit…those muffins look so good… I might have to make some for Steve and at least get to smell them when they are toasting… YUM! 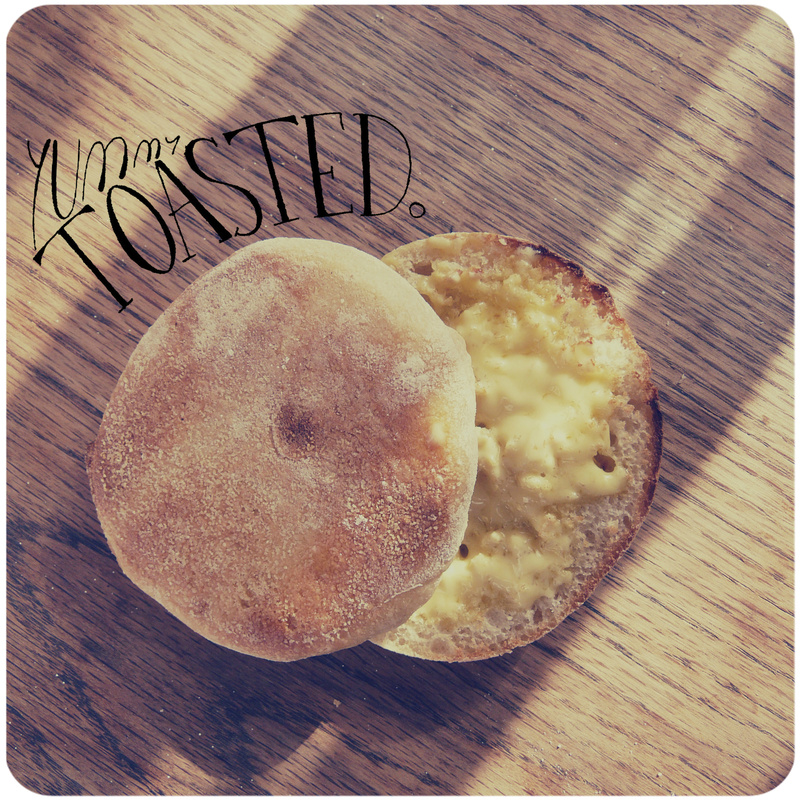 Nothing like the smell of English muffins when they are toasting, mmmm! I followed the recipe exactly and the dough was very wet. Even after adding some extra flour the muffins didn’t so much rise as splat… The end result was oddly yellow and tasted more like scones than english muffins, with a very loose structure, I guess due to the added baking soda. What % hydration is your sourdough starter? Mine is 50:50 (by weight), maybe that is wetter than yours? Other than that I can’t really think what went wrong. Yeah, that is wetter than mine, this is how I made my starter, https://invegetableswetrust.com/2013/09/01/starting-a-sourdough-starter/ its pretty basic- all my sourdough recipes use this, i did the sourdough recipes during VeganMoFo and the starter post was the first post of the month so it moved on from there, I will update all my sourdough recipes with links to this.